Description: At Geiger Lookout on Road to Virginia City, Nev.
- "DR.D.M. 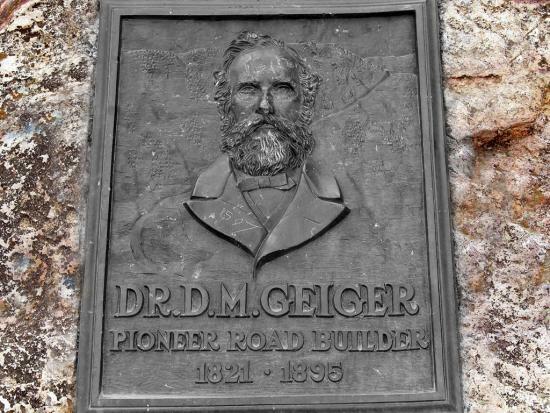 GEIGER Pioneer Road Builder 1821-1895." At Geiger Lookout on Road to Virginia City, Nev.
An early wagon road dating to the 1850s ascended north from Dayton along Gold Canyon, eventually reaching Virginia City. After 1859, another road descended east from Virginia City along Six Mile Canyon to the Carson Valley. Because teamsters used it to haul ore to the Carson River for processing, the road was named Mill Street. To the west, Jumbo Grade and Ophir Grade gave access to mills along the shore of Washoe Lake. On November 29, 1861, the Territorial Legislature granted Dr. D. M. Geiger and J. H. Tilton a franchise to develop a northern route from Virginia City to the Truckee Meadows. The resulting road opened completely in 1863 with several toll stations. Its sharp descent, including hairpin turns and steep slopes, made it impractical for heavy loads, but it was a popular route for stagecoaches. Because drivers had to slow in some places, these became favorite locations for robberies. In 1936, the New Deal Works Progress Administration improved Geiger Grade. The project bypassed the steepest grades, widened the road, and made it more functional for automobiles. Improvements encouraged tourists interested in the Old West, drawing on Reno's increasingly popular resorts. The road remains in service today.